Mark Peceny, Dean of the UNM College of Arts and Sciences talking about the Physics & Astronomy, Interdisciplinary Science facility. The proposed building will include state-of-the-art research space, classrooms, office space and much more. 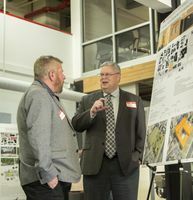 University faculty, design experts and staff from UNM’s Planning, Design & Construction were available to answer questions and chat with a variety of guests about the capital improvement projects. Six current and future developments were highlighted during the event; the Farris Engineering Center, Health Education Building, McKinnon Center for Management at the Anderson School, Physics & Astronomy, Interdisciplinary Science Center (PAIS), Johnson Center and Smith Plaza. “We want to hear from our neighbors, we want to know what they think of our projects and we want to include them in our process,” said University Architect Amy Coburn, who is also the director of Planning, Design & Construction. The President’s Office invited representatives from nearby neighborhood associations, contractors and architects to the event. Many of those in attendance said they were very appreciative to learn more about the projects and how they will affect their communities. UNM President Robert Frank speaking to Susan Bennett, vice-president of the Netherwood Park Neighborhood Association, about the capital improvement projects. Because of their locations, several of the projects will likely have an effect on foot and vehicle traffic on and around campus. University officials say because of that, UNM’s neighbors may also be impacted during construction. President Frank said that is just one of the reasons he felt it important to include and inform neighborhood representatives of the projects. 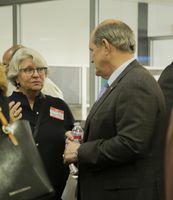 “We thank President Frank very much for inviting us to these open house events and making sure we’re informed about what’s going on,” said Maguire. Several of the capital projects are already underway while others are still in the planning phase. Currently, construction is scheduled to be completed by 2019 for all six of the projects.